I'm writing this post a little bit late since I have been really busy working on the latest WPF projects. I also went to the DevConnections conference last week in Las Vegas, so I have been quite busy for writing on the blog. 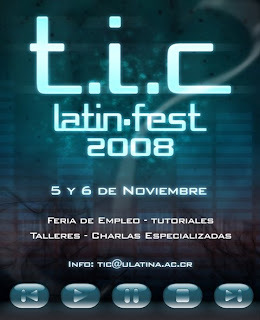 However I didn't want to miss the change to mention that I was invited to speak at the TIC-LatinFest 2008 Conference and Job Fair at the Universidad Latina de Costa Rica. The Fair was well organized having companies like Intel, Dell, and ManPower over there. I gave a presentation on Wednesday, November 5 for this event. I talked about how to build scalable, flexible, reliable and perdurable .NET N-Tier applications applying the layer separation concepts and design and architecture best practices. I also presented several demos showing how to code less, reuse more and make your applications flexible enough that changing the presentation layer can be done with very little effort. I showed a WCF sample and how to deliver the information in different ways without having to modify the service code just by adding [WebGet] attributes and configuring the service endpoints. I also explained how to use the Microsoft DeepZoom Composer to create a Silverlight 2 photo viewer using the plug-in, Visual Studio 2008 and Expression Blend 2. The other demo I showed was a WPF one, showing the water year's consumption by month expressed on a graphic 3D interface. Very nice because of the advantages of how to present the information and the interactivity it had with the user. It was really nice to speak at this event. I got several people in the presentation from the financial industry to the university students.